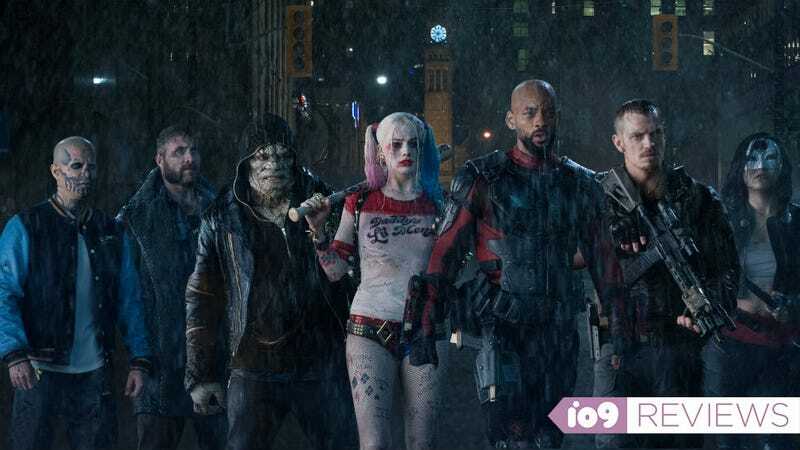 Written and directed by David Ayer, Suicide Squad follows Amanda Waller (Viola Davis) as she puts together a team of villains to help on a dangerous mission. It sounds like a simple premise, but from a pure story standpoint, it’s exactly the opposite. Imagine if The Avengers had been made before any of the other Marvel movies—it would have to introduce Iron Man, Thor, all of them individually. The same is true here. So before it can do anything else, Suicide Squad has to introduce about a dozen new characters and make you care about them. The first third of the film is nothing but set-up—there’s origin stories, table setting, villain introductions, and more. Surprisingly, all this, while excessive, is actually quite promising. It’s disjointed for sure, and things get a bit monotonous because the story isn’t really advancing, but there’s a certain energy to much of it. With this much set-up, you definitely want to see what’s next. Unfortunately, once the assembled team begins their mission, that’s where Suicide Squad starts to go off the rails. The goal of the Squad’s mission is incredibly ambiguous, gets even murkier as the narrative unfolds, and then falls apart once all is revealed at the end. Plus, the at least partially cohesive tone of the first act of the film segues into a second act that’s radically different in tone, and more of a war movie than anything else. Characters spend a good 20-30 minutes walking around just getting into gun fights. If Suicide Squad were merely an action movie, this would be exciting, but these characters are villains, some of whom have superpowers. Merely seeing them shoot guns at things isn’t that exciting. The second biggest role goes to Harley Quinn, played by Margot Robbie, who’s actually the exception that proves the rule. Thanks in part to Robbie’s memorable performance, she’s flighty, she’s unpredictable and when she’s having fun, so is the audience. She adds to every scene she’s in, and when she’s on screen, Suicide Squad is at its best. But she also brings the Joker with her, and he brings his own problem. He’s such an iconic, important villain, and yet he’s an afterthought in the film. There’s no big, meaty, iconic Joker scene for us to marvel at. His occasional appearances detract from the smaller characters the movie is actually about, to the point you almost wish he wasn’t in the movie at all. In terms of the Squad, Diablo (Jay Hernandez) gets probably the next most screen time, with Captain Boomerang (Jai Courtney) and Killer Croc (Adewale Akinnuoye-Agbaje) after that. But compared to Deadshot and Harley, they’re all supporting characters. The result is that whenever they’re around, things are very hit or miss: if they do or say something that advances the story, it works, but if they’re just standing there—which happens in a lot of the movie—you don’t care about them. Almost any of these characters could completely disappear and it wouldn’t matter in the slightest. And then there’s the Enchantress. Played by Cara Delevingne, she’s also major presence in the film and one of the main villains. However, her storyline is criminally underwritten, which becomes a huge problem in act three, when it’s basically all about her. The movie completely ignores her most of the time; so when it suddenly pivots to bring her to the forefront, it’s too late for there to be any meaningful stakes or drama. In an attempt to keep all these moving parts afloat, Ayer uses a copious amount of pop songs in Suicide Squad. Too many pop songs, if we’re being honest. From the Animals and Kanye West, to Eminem and the White Stripes, these songs are certainly nice to hear, but in almost every single case they’ve obviously been picked for very literal reasons. For example “Seven Nation Army” is played when the team comes together as an army. “Come Baby Come” by K7 is played almost solely so the line “Swing batter batter batter batter swing” can play in a key moment. By themselves, each song is enjoyable, but together they just clash with each other. In that sense, the music ends up being almost the perfect microcosm of the film—the pieces are good, but together they somehow end up making something less than the sum of their parts. Some of the action is fun, some of the characters are great, and it does reach some nice emotional peaks. But it never feels like a true, cohesive movie. It feels a B-movie—an action-packed one, but a B-movie nonethelesses—that just happens to be set in the DC Universe. It’s as if Ayer had too many balls to juggle and when they all came tumbling down he said, “Well that’s still kind of cool.” Cool? Maybe. That doesn’t make it any less disappointing.